This entry was posted on Monday, September 28th, 2015 by Frances Ryan. 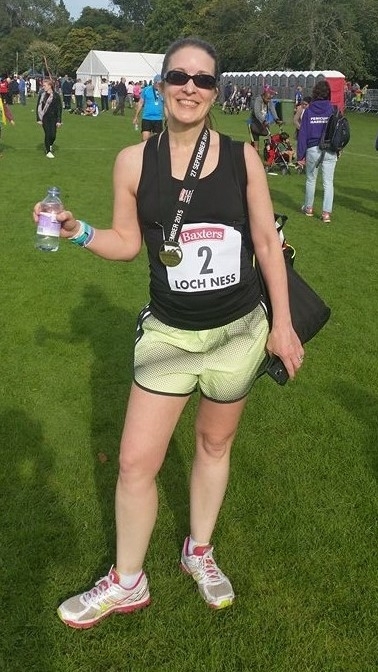 I ran my last Loch Ness Marathon yesterday. (Maybe.) And I accomplished a PB whilst doing it—which was totally unexpected. Even better, I am nowhere near as sore as I was the day after my first (and slowest) Loch Ness back in 2011. I had a minor panic attack before the race started because of a couple minor haematomas, which can be a bad thing for someone with my blood disease. And that led me to stress and worry about my physical health and readiness for the race. I was totally freaking out. But thankfully, my racing partner (David) helped to keep me calm and distracted, which helped me to get over it just in time for the starting pistol. I got a stabbing pain in my left leg in between miles 9 and 10. It was so bad that I thought I might have to pull out of the race if it continued. (It didn’t; thankfully!) It was, however, the worst pain I’ve experienced during a run, not counting that time I had a ruptured cyst on my kidney. Mile 17 to 18 (through Dores) was my slowest at a time of 15.28. Most of this slow-down was due to a wee stop-off at the facilities. This stop also meant that my mile markers were off, so for the rest of the race my gadget watch was beeping a couple of hundred feet before the mile marker signs. The weather was great! It’s the first Loch Ness that I’ve run in shorts and a tank top—without a jacket. There wasn’t a drop of rain to be had and the sun was brilliant! Thankfully, the route is just shady enough that the beautiful sunshine didn’t get too overwhelming. It was a perfect weather day for a long run! I was running with Bib Number 2! (David was bib 3.) It was so awesome because everyone knows that numbers are allocated by the order in which you register. There were lots of great comments on my race number, which was fun. And towards the end of the race, the cheers of “Come on, Number 2!” really kept me going! David ran with me for the first seven or so miles, which probably helped us both. Him to keep a decent time for his injured foot; me to help me completely overcome my panic attack and to regain my confidence. I ran with a brand-new gadget watch! Wow! I really, really do think it made a difference. Being able to see just what my average pace was throughout the race was amazing. And, in fact, I think it might be the thing that helped me get my wonderful PB! I ran without music again! That makes two half marathons and a full marathon completed without my widow-crutch iPod. Unlike the two half marathons earlier this month, I did carry it with me this time, but I didn’t use it. I am so pleased with myself for this, because I feel that it means I’ve moved forward in my grief journey enough to where I don’t need a safety net “just in case” the sad memories show up. And, of course, I ran my new full-marathon personal best! Oh my goodness, yes I did! And to be honest, I think I owe it to the new gadget watch. You see, it tells you what your average pace is. And that kept me from going too fast in the first few miles. And then it sped me up in the last few miles because from about mile 16 I started to play a game where I worked to keep my pace below a certain overall pace for as long as possible—knowing it would increase over the course of the race. I managed a sub-12-minute mile average! Again, because of the watch. I must have been about mile 21 when I first hit the 12-minute average mark. At that point, I started trying to keep it at 11.59. By mile 23 I was at 11.58. And by mile 24 I had it down to 11.57. By mile 24 I knew I was going to get my PB—as long as I didn’t drop dead. I knew that, even if I slowed, I would beat my record. And that kept me going, smiling like an idiot the entire rest of the time. Rounding the corner after the bridge over River Ness in the Inverness city centre, I slowed. It was a bit embarrassing to do it in front of the crowds of people cheering me on, but by then I knew without a doubt that I was running a PB … and I wanted to save a wee burst of energy for the finish line (and the photos!). So, there you have it: A wee re-cap of my fantastic last (but not really last) marathon with a personal best time of 5.13.48 and a pace of 11.48 minutes per mile. It was an amazing day and I am so pleased to be ending (or not) my marathon runs on such an amazingly perfect high note. Especially when my entry into the world of marathon running began out of such a tragic low note in my life (and the life of my true love). Don’t worry, I’m sure I’ll be back. As always, you can see more of my racing photos and times here. You are a superstar!!! I’m very happy for you and admire your dedication and hard work. I’ve just started to train for my first 5k and keep remembering what you said when I told you I was afraid I am too slow for running…... that no matter how slow I am I will still be faster than the person sitting on the couch. Lol.